Our 2 certificates or 2 Award Display Flag Case will be able to showcase your military certificates and awards along with an American Flag. Our case can be made out of Cherry or Oak wood, and will have a museum quality Plexiglass to protect your flag and certificates from any sun damage. 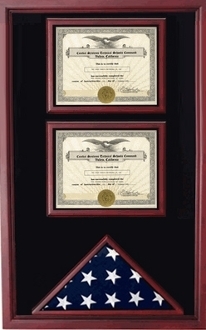 The Military 2 Certificates and Flag display Case is an exact duplication for a case that we have created on behalf of several Generals in the United States armed forces. Due to the high demand, we are releasing this case now to the public, with top of the line quality, that until now was reserved only for high ranking officials in the military. The 2 Certificates / or Award Flag Display Case is made out of the best wood available in the American Market. The flag case is made out of real natural wood not the cheaper made composite woods that are sometimes sold as imitation "knock offs." Best of all, the 2 Award Display Case is Hand Made in USA by USA Veterans. Flags presentation are a thing of honor and these is not an alien culture in the United States; in fact it is norm. Every year, more than sixty thousand flags and certificates are presented to honor military personnel and their family members for dedication to serving their country. And about four times the number presented to the military personnel are transported over to the Capitol building for the purpose of commemorating retirements from service, honor awards and special achievements. Flags and certificates of honor are an invaluable gift given to people who can be called patriots due to the parts they have played in serving their Father Land. It is a representation of the past, the present, and the future of the United States. They are a representation of honor to those who have been patriotic in their service to the Nation both in time of war and that of peace. Therefore such great and invaluable possession should be well preserved in beautiful and protective flag cases as we have here on this site. We have very good flag and certificate cases, flag and award display cases, military flag and certificate shadow box, military flag and document frame, flag and award shadow case, burial flag cane and certificate frame and so on. It is not worth it for one to get so great an honor from the nation and, due to improper protection, loses it or gets it damage. To prevent such losses, we are offering you the best burial flag cases and casket flag display cases for our heroes who died working or fighting for their beloved country. Flags and medal display cases for those to be honored for selfless service to the Nation. Military Medal display cases for the gallant men of war fighting to sustain the Nation’s peace and harmony. Flag and documents display cases are also available for your use. You just relax and browse through the site to get the flag and certificate that suits you most; or the flag and award display case of your choice. Best Military flags and document cases are also available for you on this site. And what more is that these Flag cases, certificates and documents cases come with the most reasonable price ever that could be! And they are made in America too! It has a Plexiglass front and black lining for an elegant touch. Orders for Award and flag display case display Case are usually shipped out within one business day to places within the USA and Canada. I was happy you delivered the exact item I saw on the image of your site. The Award and flag display case display Case is sturdy and a beautiful finish. It had ample space for me to personalize a sentimental engraving for my husband. I never anticipated this purchase: however, I am very pleased with the burial box or any Award and flag display case display Case for my sister’s husband. She had a tough time choosing but in the end, loved my selection. The flag and great seal do a wonderful job dignifying the final resting place of a fallen soldier. I browsed local stores as well as online for a flag and document case and am very satisfied with my purchase of the Award and flag display case display Case . I love the construction and finish. Thank you once again for such an esteemed burial box for a cherished friend. I love how the flag and medal case is constructed. It arrived in an excellent condition and I couldn’t be happier that my grandmother is being represented in such an honorable way. She was the wife of a veteran, who fought just as hard to keep her family together when he was at war. We love her and miss her, and are glad that she will be commemorated in a distinctive, proud way. Thank you for an easy transaction. I never thought I would have to make this purchase but fortunately you’ve made it easy for me in a very difficult time. The military flag case portrayed our late uncle in a dignified way during his memorial service. I love the triangle shaped flag in the flag frame above the display case and the great seal completes the look. Your Award and flag display case display Case represented our family well. I had no hassle in making the order and I received a very prompt delivery, well before my friend’s scheduled memorial service. Thanks for a beautiful flag and certificate box. This Award and flag display case display Case is just the thing I was looking for to honor my late father. I had a classic cremation urn before, but felt that this solid wooden case was a bit more suitable with its flag overlay. He served for 20 years in the force and this was very appropriate. I wish I knew about these before. Nothing but the best for Dad. 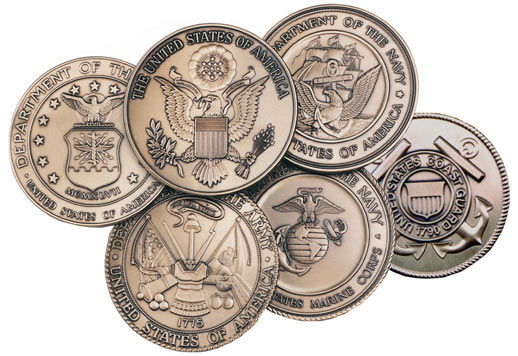 * Select Air Force Army Navy Marine Corps Coast Guard Great Seal of the U.S.